The Bull trout (Salvelinus confluentus),was native to the McCloud River below the Lower Falls to Shasta Lake. This is the only area in which the Bull Trout was native to California although it is widely distributed throughout the interior portions of Oregon, Washington, Montana, Idaho and British Columbia. It was our only native char. The name to this trout was orignally the "Dolly Varden". It's name is also a California origination. A publication by Evermann and Bryant in 1919 noted that when this fish was taken by scientists, staying at the Upper Soda Springs Hotel on the McCloud River, the resemblance to a dress material with spots called Dolly Varden, and which was then the rage, led to its being given this name by the lady members of the party, ... "Dolly Varden". The original Dolly Varden is a character in the Charles Dickens's novel "Barnaby Rudge" and was well known as being quite flirtatious wearing her flashy attire and colorful dresses one of which was green with pink polka dots. The trout was originally described by Johann Walbaum in 1792 in Kamchatka, Russia as "Salvelinus malma". The term "malma" is a vernaular name in Kamchatka. The names, Bull Trout and the Dolly Varden, were used interchangeably until 1980 when the Bull Trout was genetically proved to be a separate species. Since that time the "Dolly Varden", which was named on the McCloud River, was actually the Bull trout. The Dolly Varden does exist. But , it is a coastal fish which is distributed just south of the Canadian Border to Seward Alaska and in Asia from the Yali River, Korea to the Anadyr River. Due to competition from introduced Brown Trout, the Bull Trout no longer exists within the McCloud Watershed. It was reintroduced by the CA. DFG at least once but this reintroduction was not successfull. Nevada has a single Bull Trout population isolated in the Jarbridge River with about 50 fish. There are about 70 populations of Bull Trout in the Columbia Basin and 9 populaations in the Klamath Basin. It is hypothesized that the origination of this species occurred during the last glacial period. There is currently no program to recover the Bull Trout in California. The problem is that too many other species can outcompete the Bull Trout for survival. Closely related brook trout and lake trout juveniles can push out young bull trout. Lake trout, a voracious predator, can prey on bull trout. Brown trout, pike, and bass can also compete with or prey on bull trout. And brook trout can interbreed with bull trout, creating mostly sterile hybrids. This interbreeding saps reproductive energy from the bull trout population. The McCloud River portion in which the Bull Trout were originally found has since been supplanted with these competing species and it is politically impossible to remove those competing species in order to reintroduce the Bull Trout. 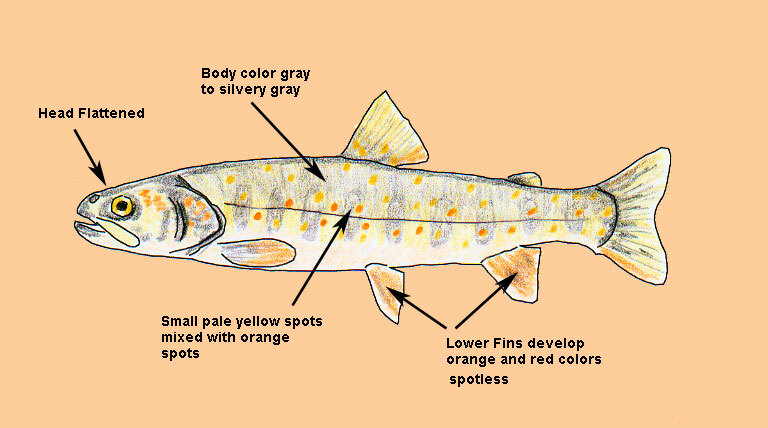 The Bull Trout has an Gray to Silvery Gray body with a light gray or white belly. The back can be infused with an olive coloration. It has pale yellow spots. There are no Black spots on the body or fins. Small orangish spots are located on the lower sides. Fins are plain and unmarked.